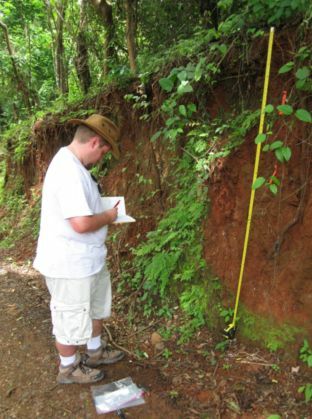 Shawn Morrish, also joining our Master's program this fall, recently completed his senior thesis project on Quaternary river terraces along the Rio Ora on the central Nicoya Peninsula, Costa Rica. His study involved mapping terrace surfaces, describing fluvial deposits and soils, and generating longitudinal terrace profiles. He also correlated the Rio Ora terraces with marine terraces along the coast and other fluvial terraces within the peninsula's interior. The goal of this investigation was to unravel the late Quaternary history of terrace formation, tectonic uplift, and stream capture. This project is part of a larger regional investigation of Nicoya Peninsula neotectonics and paleogeodesy directed by Dr. Marshall. 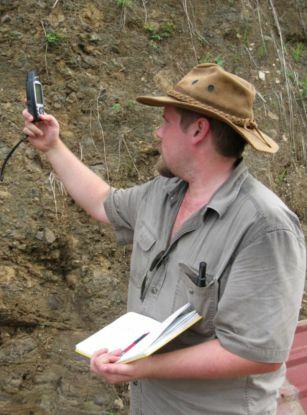 Shawn is coauthor on sevaral GSA presentations related to the active Costa Rica margin. the first of many examples is from the 2008 GSA Annual Meeting in Houston Texas. Shawn's presentation was entitled "Coastal Tectonics of the Nicoya Peninsula Seismic Gap, Costa Rica" View an abstract of the presentation.